At first glance, a new business agreement between home charger manufacturer eMotorWerks and utility software provider LO3 Energy sounds strictly like the stuff of dull business contract lawyers. Dig a little deeper, though, and it could be the kernel of the next generation electrical system, long discussed, but never-quite-practical vehicle-to-grid infrastructure. LO3 Energy provides a blockchain-software platform that allows consumers to trade electricity on a local grid, setting prices and managing supply and demand locally. 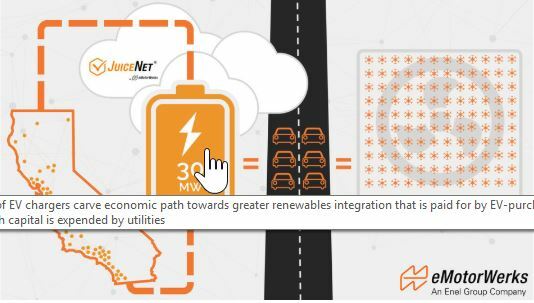 The eMotorWerks JuiceNet platform enables control over local energy flows, while LO3’s software enables energy trading on local networks at set prices. 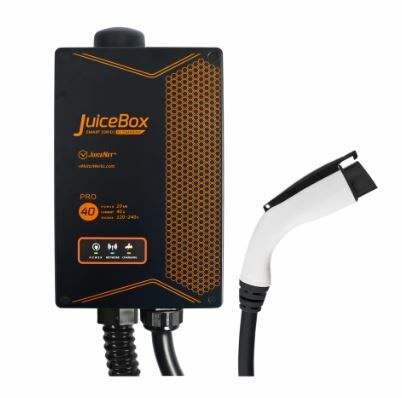 The tie-up between the companies, announced last month, aims to demonstrate that not only can JuiceBox users get the lowest available rates, they can also ensure that they get power supplied to their plug-in cars from appropriately renewable sources. In their latest agreement, the companies plan to select an LO3 microgrid site, such as one the company operates in Brooklyn, New York, to demonstrate the program. (It could select a different LO3 microgrid.) The pilot project is expected to show how spreading charge times across multiple cars can reduce peak demand on the grid while still charging all the cars that need to get charged. 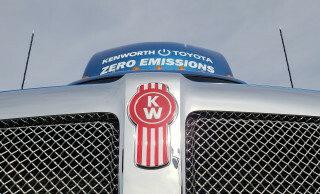 The companies point to an eMotorWerks demonstration project announced in September in California as an example. It uses 10,000 electric-car chargers to balance up to 30 mega-watts of renewable power in the state, to reduce on-peak demand for non-renewable power—the equivalent of 120,000 home air conditioners. So far, challenges winning support from automakers, over concerns with battery cycling and warranties, as well as cost of cars and chargers, have stymied full V2G interactions, where power can flow both directions, from the grid to the car and from the car to the grid. Preston Roper, general manager of e-mobility for Enel X in North America, which now owns eMotorWerks, says the two-way communications behind V2G can achieve most of the benefits of V2G with power flowing only from the grid to cars, by managing the charge load and timing among different cars. "You pretty much get half the value of V2G with V1G. but we can use all the services," he says, referring to unidirectional vehicle-grid integration. "From the grid perspective, it's the same." DON'T MISS: No, electric cars (still) aren't crashing the grid. Again. Such vehicle-grid integration can, for example, help utilities to avoid large spikes in local demand that can blow up transformers, for example, thus saving costs. 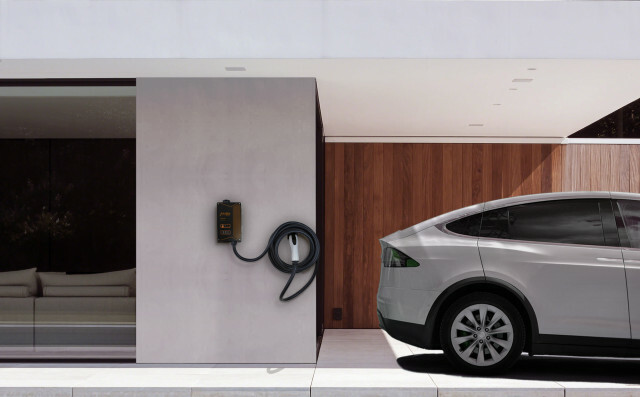 And for businesses with several chargers, or hosts of Tesla supercharging sites, for example, can minimize expensive demand charges that utilities sometimes charge during peak usage. By allowing the electric-car drivers to set prices at which they are willing to pay to charge, the system lays the foundation for vehicle-to-grid concepts while ensuring that the car gets charged sufficiently to get them to their destinations. Roper uses his own electric car as an example. He says he commutes only about 40 miles a day, which takes only a little over an hour to charge every night. By using eMotorWerks' predictive software, the car charger can choose the hour during the night to charge when renewable generation is highest or rates are lowest. V2G, as it has become known, envisions the large battery packs in millions of electric cars on the road as storage buffers for renewable energy, such as wind that is produced off-peak at night, to use under peak loads during the day. With the average vehicle parked for 92 percent of its life, according to studies, electric cars, plugged into the grid, could alleviate the need for billions of dollars of dedicated battery storage for renewable energy installations. 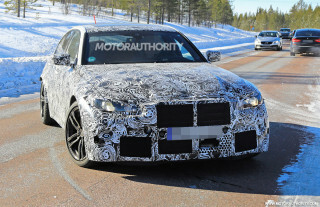 Make no mistake, this tie-up doesn't enable V2G on its own. 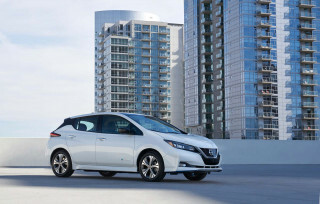 Other factors, such as connectors, building codes, and battery warranty questions would have to be addressed before electric cars could be depended on to feed power back to the power grid. Still, the ability for electric-car drivers to specify and receive one source of power over another, controlled in real time by the charging station, can provide proof of concept to fix one of the major concerns about wider use of V2G systems.